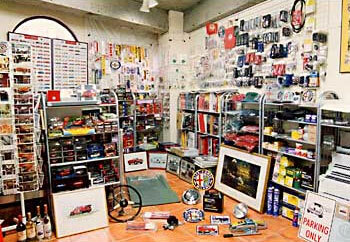 Our shop -- me -- ALPHA ROMEO,MIRREMIRIA,NUVORARI,AUTOBIANCHI, andMITSUBISHI -- a favorite hobby -- the exception of a main occupation -- a photo studio -- It is carrying out in one corner The things relevant to these are collected out of the world, and exhibition & sale of them is done. Opening time is from 10:00 to 19:00. Our shop has arranged the rare article. Although a parking lot is located at our shop, since it is narrow, they are about three small-size cars. Please use neighboring coin parking lot when your car is large, and when our parking lot is full.